Want to lighten up a burrito? Try this vegetarian version with cauliflower and beans. It is delicious! It’s become a habit any more to find ways to cook any dish with lower calories. I also try to find ways to eat less meat and lots more vegetables. That it’s vegetarian is just a bonus. Lately I’ve been on a cauliflower kick. Since trying it as a rice substitute in my Fried Cauliflower Rice and then mixed with potatoes in Cauliflower Mashed Potatoes, it inspired me to try substituting it in other meals. Since then, I put it in so many dishes, including these burritos and even egg salad. I love the fact that an entire head of cauliflower has less than 150 calories. Compare that to over 200 calories in a single cup of rice, or 160 in a single medium sized potato. It’s amazing how versatile it is, and how well its flavor adapts to what you are preparing. Today I decided to try it as a ‘rice’ and bean burrito, and loved it! I know some of you will say you don’t like cauliflower, or its aroma. Even if you don’t, I bet you will enjoy this recipe. You don’t taste–or smell–cauliflower, but it adds a great flavor and texture, besides saving on calories. You don’t need rice at all! If you have kids who aren’t crazy about vegetables, this is a great way to sneak in a serving or two. It’s quick and easy. You can add chopped mushroom or peppers if you like. If I don’t have home cooked beans on hand, I’ll use a a can of fat free refried beans. Plus, normally I would use low fat shredded cheese. 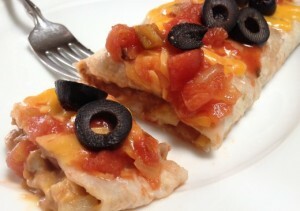 If you are serving a group, I’d set the burritos on a cookie sheet (use parchment paper for easy clean up) or in a baking pan to melt the cheese in the oven. The cauliflower ‘riced’ is delicious. You can run it through a blender/chopper like my favorite one, the Ninja Master Prep Professional, or you can use a hand grater to get the ultra fine, rice sized bits. It doesn’t have to be riced though. It’s also delicious added as small nibbles–that’s my favorite for this particular recipe. The flavor still is absorbed by the beans and salsa, so you won’t have the taste of cauliflower. However you put it together, it tastes amazing! It’s going to be a regular on my meal plan. Saute garlic and onions for 3 or 4 minutes until onion is becoming opaque. Add chopped cauliflower, and sauté another 1 to 2 minutes. Add the refried beans and the fresh chopped cilantro, blending together while stirring until thoroughly heated. Sprinkle with a portion of grated cheese. Sprinkle each with one tablespoon of salsa. Top with remaining cheese and sliced olives and/or green onion. Sprinkle with additional salsa or reserve it to serve with the meal. Warm in microwave until cheese is melted (or in oven at 350 degrees for 5 to 10 minutes. This pan works great for this recipe and most others! I like the depth of it along with the glass cover. It’s my favorite skillet, one I’ve had it for years. Calphalon is an excellent product that works so well. It cooks evenly, almost never sticks, and cleans up beautifully. It’s a good heavy pan. I’d highly recommend it. Tortillas are so good served with breakfast, lunch or dinner. Do you serve them instead of dinner rolls sometimes? If so, one of these will get a lot of use. Warm them, and keep them warm with this. Serve with butter. Yummy. Handy too, if you like to build your own burritos at the table. A warmer is perfect for keeping them ready to use.